Spoilers for Spider-Man: Homecoming included below. When you announced that the Spider-Man franchise was rebooting again, I was a little worried. Did we really need another Spider-Man film with another actor? Did we really need another Peter Parker origin story? I was hoping you'd pull together your comic-book resources and bring Miles Morales (or even for the love of Thor's hammer, Spider-Gwen) into the mix, but you didn't. Still, I had a little hope. Tom Holland wasn't a name I was familiar with; there was no baggage associated with him. I was willing to give him a chance (mainly because he wasn't one of the others on the list of potential Peter Parkers). 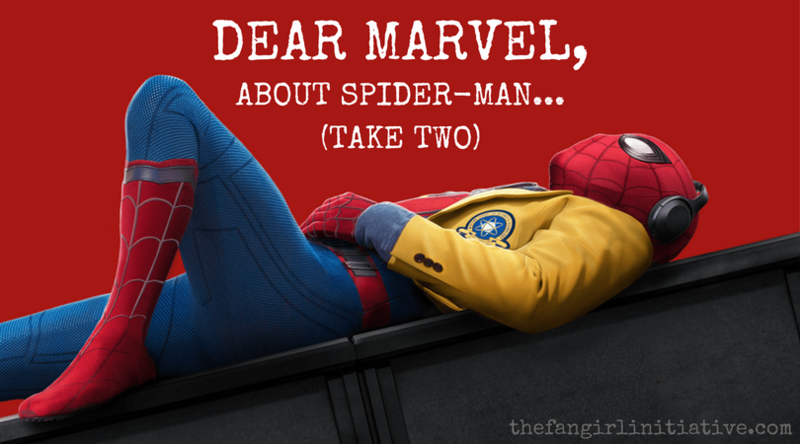 Plus, when it comes to the Marvel Cinematic Universe, you have yet to disappoint me. As I watched Captain America: Civil War, I prepared for the worst... though my generous superhero-loving heart prepared for the best. And what I got was definitely closer to the best side of things. For one, Peter Parker was a teenager. A teenager! Finally. For another, he was hilarious. (His fight with Sam and Bucky: pure gold.) But I was still a little unsure. I wanted to see more, I wanted to dive deep into his story, into his lore. I went to see Spider-Man: Homecoming with eager anticipation. And within the first five minutes of Peter Parker on the screen (excluding the opening set-up for the villain arc), I knew I was sold. Peter making a video of his adventures with Tony Stark and the Avengers. Peter freaking out when he stole Captain America's shield. Peter dumbstruck when Tony Stark dropped him at his house with a brand new Spidey suit. It was all marvelous. And the marveling only continued throughout almost every moment of that film. You, Marvel. You. You gave us the Spider-Man movie I didn't even know I wanted. You seamlessly assimilated Peter Parker into the Marvel Cinematic Universe, yet kept Peter a fifteen-year-old kid trying to navigate high school, first love, and being a secret superhero. You gave me the Peter Parker I've been waiting for. You also managed to tell an origin story without it being an origin story. This goes beyond the origin of how Peter gains his powers. We've seen that, over and over already. We didn't need that for this movie. Instead of that, we got the story of Peter Parker—of Spider-Man—becoming a hero, becoming an Avenger. And that worked so well. You also introduced us to great characters like Ned, who I may or may not love more than Peter, and that chess kid, who was random but hilarious. You somehow made me adore MJ without even knowing it was MJ! (Seriously, man, I'm still shocked about that. She was my favorite throughout the film, and I spent the movie going.. ugh, Liz, why. But then you threw that curve ball at the end, and my jaw literally dropped before I exploded in a flurry of excitement. Double fist pump to the air.) You made a reference to Miles Morales (as well as, I'm sure, a thousand other things from the Marvel Universe). You emphasized that sometimes there are more important things (like, I dunno, saving the city/world/Happy's airplane) than getting a girlfriend. You provided us with an awesome new Spider-Man suit that is way cooler than any previous suits. You kept universe consistency throughout the story. You even gave us more Tony Stark and Pepper Potts. (And Tony and Pepper together.) You made it light-hearted instead of making it full of dark teenage angst. Basically, I want to thank you for this film. There is too much to mention in a single letter, but thank you. For what you did with Spider-Man's character, with his story, with his heart. I look forward to future films with Tom Holland as Peter Parker. He did fantastic. I never should have doubted you. P.S. No, I will not forgive you for that ending scene. I know what you were doing. Thumbnail was made using an overlay from the Spider-Man: Homecoming official website.